Do you have aspirations of studying, working and living in Germany, one of the most affordable and widely recognised study destinations for international students? 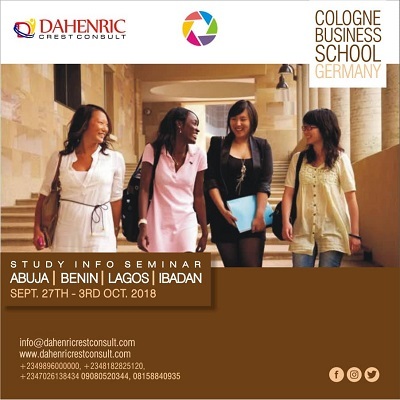 This is your opportunity to meet with International Office delegates from Cologne Business School Germany as they will be visiting some cities in Nigeria which includes: Abuja, Benin, Lagos and Ibadan. 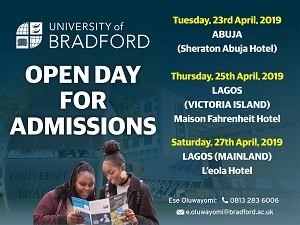 At the seminar, on spot Admission will be offered to qualified students. Please come along with your documents. Career counseling and visa application guidance will also be available. Call +2347026138434, +2348158840955, 08182825120, 09060000000. Venue: Box Office, 2nd Floor, Rock and Rule Suite, Discovery Mall, 215 Ademola Adetokunbo Crescent, Wuse 2, Abuja, FCT. Venue: Constantial Hotel, 24/26 Airport Road, Oka, Benin City. Venue: 3rd Floor, L’Monarch Tower, 65C Opebi road, Ikeja Lagos. Venue: Suite 13, Rehoboth plaza, Besides ANCE Building, Magazine Road, Jericho Ibadan, Oyo State. Enjoy 98% visa success rate! Get on board this Study Flight and we will pilot you to your dream destination!